I’ve been a runner for probably 7 or 8 years now, but it wasn’t until this past January that I finally started ‘barefoot running‘. The funny thing is that I still wear shoes when I run, but I’ll get into that later…. The story starts about a year ago with the purchase of a new pair of same-shoe-new-model Nikes that trashed my knees and ankles and spiraled me into not being able to run, gaining a few pounds, struggling to keep up my capoeira game, and dealing with the thought that I’m just going to have to face the fact that I’m getting old. 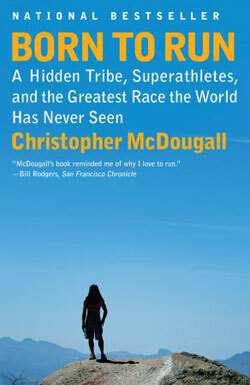 Luckily my mid-term memory is better than my short-term memory, and I kept thinking about the book I’d read over Christmas break in 2009: Born to Run: A Hidden Tribe, Super Athletes, and the Greatest Race the World has Never Seen by Christopher McDougall. Hype generally turns me off (and there is certainly a lot of hype right now around barefoot running), but this book touched all the right nerves: anthropology, natural fitness, shifting paradigms, sticking it to the man, history and culture, a great story, good writing, running, and being barefoot. It finally hit me, after 6 months of joint pain, that I could blame everything on those damn Nike shoes and start over. Meanwhile, 2 of my brothers had also read Born to Run. My youngest brother has always been a slender, healthy runner. My middle brother is tall, super muscular and has perpetually complained that his bad joints prevent him from running. Without even knowing it, the three of us were on the same barefoot running track. My middle brother and I spent last Fall obsessively sharing information about barefoot running on Facebook, dropping articles and videos and instructions back and forth. My youngest brother would chime in now and then, though he was already easily doing double-digit mile runs in the San Francisco hills. Finally while I was visiting my middle brother in New York in December, he and I decided we’d both get serious, invest in some official barefoot running shoes, and (re)train ourselves to run. This is where I explain that most people who ‘run barefoot’ actually wear some kind of ‘barefoot running shoe’. Normally this means Vibram Five Fingers, which look like a wet suit glove for your feet; huarache sandals (apparently the ‘next big thing in barefoot running’); or some kind of minimalist shoe, as in the photo below. All this footwear is designed to be as minimal as possible while still protecting your feet from concrete or glass or whatever you might find on the ground while running. Part of the logic behind barefoot running is that the overdone structure in most running shoes weakens the muscles in your feet and calves (kind of like putting your foot into a plaster cast). Regular running shoes also encourage you to land hard on your heel rather than gently on your forefoot, causing all kinds of knee, ankle, back and hip stress and injury. Running with proper form (see graphic below) reduces shock to the joints and allows you to put less stress on your body. It is one of the main reasons that people learn to ‘barefoot run‘. So anyway, my brother got the funny looking Vibram shoes and I went for the less obnoxious-looking ones (in the photo above). As of January 1, we started re-training ourselves to run with a proper ‘barefoot stride’ for short distances on the treadmill. We’d regularly text, message and email each other about our progress. By March it was warmer and we both got to running outside. Whenever I am in NYC, we plan our days around long runs together over the Brooklyn and Manhattan bridges. My eldest brother who lives in Los Angeles had also started running (though we’ve yet to evangelize him to go barefoot). He and my middle brother started using the Nike+GPS app to track their routes, distance and pace. 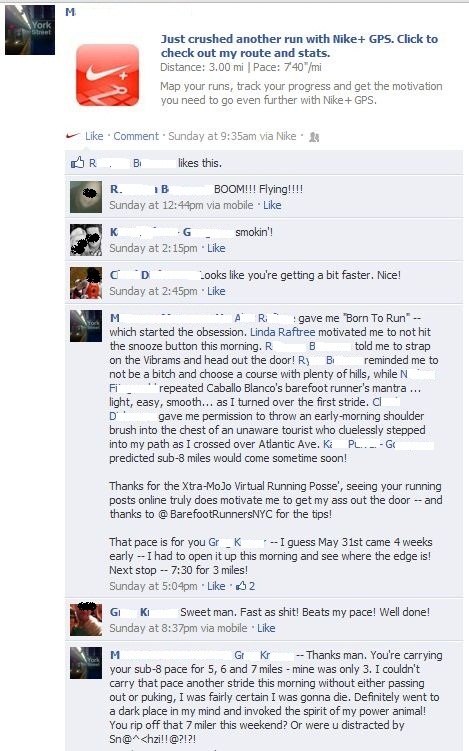 I started seeing all kinds of comments on their pages from friends and fellow runners, barefoot and not. I resisted the Nike app for a number of reasons but eventually caved. Once I started using it, I joined the group of motivators and found myself motivated too. I was more aware of my pace because the app was notifying me each half mile how fast I was running. I’d always run a slow and easy pace of 10 minutes per mile over a maximum of 5 miles and had no real interest in picking it up or pushing myself. I still can’t totally keep up with my brothers and their friends in terms of pace, but I’m now running more hills and I’ve shaved 48 seconds off my mile average in the past month since I installed the app. On top of running better and longer and faster, I wanted to ditch those few extra pounds that had accumulated from my months of not running. So in early January, I downloaded a free app called “Lose It,” which allows you to research and track everything you eat and to plug in calories burned through exercise. It helped me pay better attention to what I was eating, make healthier and more natural food choices, and ensure that I was not eating more than I was burning off through exercise. My daughter downloaded it too, and it’s been a helpful neutral tracking tool for us to motivate each other. Being lighter is helping me to run more gently, and it’s also meant my speed and agility in capoeira have picked up. Not to mention, my knees and ankles feel great (knock on wood). The barefoot running obsession is not only mine and my brother’s. My son was with us at the shoe store in December and hinted around that he needed a new pair of running shoes. My brother told him that if he read Born to Run, he’d give him $50 towards a pair of Vibrams. Deal complete, my son got his shoes in March, worked on his barefoot stride a bit, and is off and ‘running barefoot’ as well. Via Facebook I discovered a few other friends are into it, including a college roommate I hadn’t seen in 4 years and a fellow development worker, Weh Yeoh, who does barefoot running training in Phnom Penh and has even done a “Nerd Night” talk on it. (Check out Weh’s awesome other project here). Below is his video on how to run with proper ‘barefoot’ stride. I’ve never been someone who needs to have the latest shoes or apps or gadgets. But since January, this perfect storm of information, communication and technology (books, videos, articles, blog posts, social networking, improved shoes and a couple of mobile apps) along with self-motivation and the encouragement of family and friends, has allowed me hit my sweet spot and reach my health, fitness, running and capoeira goals. For some really interesting research, reasoning and background on barefoot running, check out this 2009 post by fellow anthropologist and capoeirista (check out his book) Greg Downey – Neuroanthropology: Lose your Shoes: Is barefoot running better? And by the way – new research is showing that running (and other exercise) makes you smarter too :-).